Saudi Arabia celebrates its 4th National Day today. I remember that when it was first celebrated in 2005, my Saudi friends didn't even know what the holiday was for. All they knew was that there was no work and that they were free that day. Unlike in the Philippines when any day can just be declared a holiday by anyone who sits in power, Saudi Arabia has only 3 non working holidays that I know. One is the Saudi National Day, the Ramadan Eid Holidays (Eid Al Fitr) and Hajj Eid Holiday (Eid Al Adha). Their very limited holidays could have been the reason why they were not aware of the holiday's significance to their lives at that time. Now, 4 years later, my Saudi friends tell me a day in advance that September 23 is a holiday because it marks the unification of the country by King Abdul Aziz in 1932. They would tell me the history of the Kingdom of Saudi Arabia dating back in 1740s when the ruler of the central Arabian Peninsula, Muhammad Bin Saud, formed an alliance with the reformer Muhammad Bin Abdul Wahab and this partnership led to the founding of what we have today as Saudi Arabia. The Al-Saud family ruled much of the Arabian Peninsula throughout the 19th century. In 1902, Abdul Aziz Bin Abdul Rahman Al Saud triumphed in recapturing Riyadh from the Al-Rashid clan and thenext thirty years united the numerous and disparate tribes into one nation. it was on September 23, 1932 that the foundation of the modern Kingdom of Saudi Arabia took place. I would like to share a personal reflection of Khaled Almaenna, Arab News Editor-in-Chief on the meaning of the day. He wrote this piece way back in 2005 when the holiday was first celebrated. 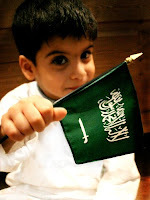 Today is Saudi Arabia’s National Day. It is the first time that this event is being publicly celebrated across the land in the form of a nationwide holiday. But what does National Day actually mean to the citizens of Saudi Arabia? Is it merely a day of fun and merriment or a day for something deeper and more symbolic? In my estimation it should be viewed as an opportunity for introspection as we not only look back at the different stages of nation-building, consolidation and achievement but also look forward to the future and all the concomitant challenges that lie ahead of us. The ability to face these in the coming years will be far tougher and more diverse than we can imagine. However, we have to rise to the occasion and meet them headlong. Over 50 percent of our population is under the age of 25. We have to seize the moment, think creatively and come up with solutions to pre-empt future problems before they even arise. But first it is imperative to identify these problems. We have no time to lose. The whole world is forging ahead. Our neighbors to the East: India, China and the whole of the Far East are buzzing with economic activity. They have become nations of producers while we are still consumers. Their research centers have become the envy of the world. Their young men and women are being enticed by Western universities to join them. Taking all this into consideration, I expect that we too should create an educational system that will help our young men and women reach a global competitive level. We have immense talent. We need to discover, encourage and nurture it. Another important issue is that of governance. Both King Abdullah and Crown Prince Sultan are determined that Saudi Arabia be a modern state with clear laws that give citizens their rights. Accountability and transparency are high on their list of priorities. They are keen to push for reforms that will have a far-reaching effect and help propel the country well into the 21st century. To do this effectively another aspect of society should not be ignored. That of the role of women. The Saudi woman is smart, educated, cultured and capable. She is prepared to play a pivotal role in nation-building. She is not willing to sit idle and be spoken to only and if necessary. She is ready to face the challenges that present themselves — and she does not want or deserve to be patronized. Any society that ignores women and their contribution to economic and social development does so at the very risk of its existence. We can’t afford to do that. So let us resolve on this day to promote further the cause of women and to elevate them to greater heights. I am sure many of them will attain these levels much before their male counterparts. As we reflect once again on the National Day we should also be thankful: First to Allah for having blessed us with the Two Holy Mosques of Makkah and Madinah. Then for the decades of security and stability that we have enjoyed. While other nations around the world floundered we kept going on. But as we appreciate the past we also should be concerned about the growing menace of terrorism — an alien philosophy that has crept into the minds of many of our youngsters. We have to work together to address this issue and eradicate its dangers. And to do all this we have to have a dialogue. Every voice within our midst should be heard; no matter how small. And we should show compassion to those who are lesser privileged. It is no use displaying a false sense of patriotism. Scoundrels throughout history have been doing that. What we truly have to ask ourselves on this day is what can we do for our country. An honest answer will determine our future. Eid Al Fitr 2008 Greetings!